Growing up in a tennis family Freddi Ford undoubtedly always enjoyed tennis and attending the US Open. Freddi’s father played for Yale and was a competitive club player, her mom played a couple of times a week and both her brother and sister were college tennis players. At around age 30 she found out about USTA league tennis and completely fell in love with the game. Even through three pregnancies Freddi played several times a week and on many USTA teams. Her doctor always encouraged her to stay active and fit through tennis. She found that playing the sport was a great way to stay healthy and feel at her best. At seven months pregnant with her second child she played singles in a big playoff match at the National Tennis Center in very hot weather conditions and felt better than ever. Her second child Hank was born with a rare cancer Neuroblastoma; a tumor in his pelvic region. She and her husband Michael spent the first six months of his life alternating stays at the hospital as well as taking care of their other son Michael who was a year and a half old at that time. Hank had multiple surgeries as well as four cycles of chemotherapy. With the support of family and friends they all locked arms to help Hank battle this terrible disease. Occasionally Freddi was able to play a little tennis while her mom took care of the boys. Tennis came to be an amazing outlet at this difficult time. 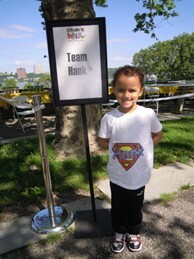 Hank fought the disease very hard thanks in large part to great care at the Herbert Irving Child & Adolescent Oncology Center (HICAOC) at Columbia University Medical Center. He beat cancer and is now a survivor! A few weeks ago Freddi and her husband along with their three wonderful boys Michael, Hank and Abraham walked for Hope and Heroes (an organization that raises money for pediatric cancer research and care). They were joined by her parents and her brother and sister and their families. They raised almost twenty thousand dollars through the generous donations of family and friends, including great tennis friends too. Freddi feels extremely lucky that Hank is healthy and cancer free and that she has such a wonderful support circle. Freddi and her family will continue to support Hope and Heroes because they feel blessed that their little "superhero" Hank is healthy!